Creating an offline update CD is a great way to update a Windows machine when you don’t have an available Internet connection. It can also make updating faster because you can reuse the CD on multiple machines and no longer have to wait for the updates to download. Since Microsoft offers no easy way of doing this other than ordering one of their update CDs, I would like to show you how to create one yourself. Step 1: Download and extract Offline Update. Step 2: Run “UpdateGenerator.exe” and select the products you wish to create an offline update CD for. Your options are Windows 2000, Windows XP, Windows Server 2003, Windows Vista, Office 2000, Office XP, Office 2003, and Office 2007. You can also select the type of ISO file you want to create under “Create ISO image(s)”. You can create an ISO per product and language or one large “cross-product” DVD for all multiple operating systems. Click “Start” to download updates and create the ISO file. Step 3: When Offline Update is finished, navigate to your “iso” folder under the directory you extracted the Offline Update program to. Depending on the ISO selection you made, you will either see an ISO file per product or one large ISO file for all products. Burn the ISO file to a CD or DVD. Step 4: Put the CD or DVD into the computer you wish to update. The update installer should auto run. If it doesn’t, navigate to the CD and run “UpdateInstaller.exe”. Choose “Automatic reboot and recall” to have the computer automatically restart the update process after a reboot caused by an update. This option makes the update process fully automated. 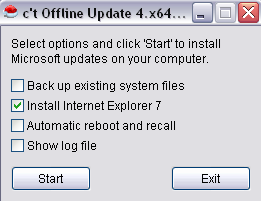 Offline Update also gives you the option backup your system files or to install Internet Explorer 7. When you are ready to begin the update process click “Start”. Offline Update will now scan the computer to see which updates are needed and will only install them if they are. If you have any experience with Offline Update or any other types of update utilities please feel free to share. There are a few other programs out there like this one, however this is one of the easiest applications to use. This is exactly what I need, except, it hangs at 99% on wssusscan2.cab. I can’t get past that point. Any suggestions? I tried to download the program, but it seems to be a non english version! Any help? It looks like the link was broke so I updated it. It should work now. Thanks for the heads up. Thanks a lot Casey. I could download it. Any missing update was either blacklisted or not found. what should i do next….?????????????????? Hi, when downloading only Finnish updates for Windows XP getting German language files. I would be pleased if You could fix this, please. Same happens also when downloading only English updates. 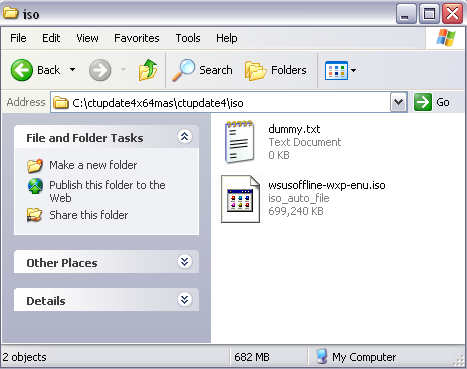 German language pack files are found also in this case from folders. Case of downloading Finnish files, you do not actually get only English and German. Using version 8.2 I am getting also Finnish language files for hotfix updates. But, when looking dotnet part, there are still those German language files, but nothing for Finnish. Could you please look that. During install, I clicked the WSUS button at the bottom and pointed it to my WSUS server. Since I did this, will this tool -ONLY- install updates I have approved on the WSUS server? How does this work?